So many times, we think that, if only I had more money, I would have been happier. In fact, it is a very hard to understand fact that, money does not bring happiness. You cannot buy Happiness with money. Yes, money can buy you all those things that might give you comforts, security but not the happiness itself. One might be the world’s richest person have a thirty-bedroom house, twenty cars and a private jet but, it doesn’t mean that he is happy. It is said that Happiness is the state of mind created by positive and good emotions. And, the state of mind depends on some of the external factors like the weather, environment, people around or internal factors like feelings of low or high, moods like anger, depending on the personality of an individual. In fact, there are so many research studies conducted which studied the happiness levels of different people and concluded that, money can buy you free time, satisfaction of helping someone in need which in turn might make you happy. But, beyond certain middle class income meeting the basic needs, money does not bring the happiness in the proportion it is accumulated. For, example a Millionaire is not Million times happier than a normal person. And, this is what had been told by all the wise people in all the world religious books, from Zen’s to the Saints. However, when people hear or read of these things might have things to comment like, the Story of a Fox and the Sour Grapes. Because, you don’t have, you consider money like a fox, which tried to reach the grapes hanging on a vine, could not reach them and finally declared that, the grapes are not worth trying for because, they are Sour. That is when, the words from these people like Adam Khoo comes as a real testimony. Here is an interesting article by Adam Khoo who is an entrepreneur, a bestselling author and a peak performance trainer. A self-made millionaire by the age of 26, he owns and runs three businesses with a combined annual turnover of $20m. He is the Chief Executive Officer of Adam Khoo Learning Technologies Group Pte Ltd, one of Asia’s Largest Public Training Companies and Education Group. He is also the Managing Director of Adcom Pte Ltd, an advertising agency and the co-founder of Event Gurus Pte Ltd, an event management company. Let's read what are his thoughts and comments about Money, Happiness and how to lead a sane life. I liked his straight forwardness, honesty in expressing his true feelings and giving insights to his world of a millionaire. As you can read, it’s not the money that make him happy but, the character, vales, life style and life choices that makes him happy. "Some of you may already know that I travel around the region pretty frequently, having to visit and conduct seminars at my offices in Malaysia, Indonesia, Thailand and Suzhou (China). I am in the airport almost every other week so I get to bump into many people who have attended my seminars or have read my books. I refuse to buy a first-class ticket or to buy a $300 shirt because I think that it is a complete waste of money. However, I happily pay $1,300 to send my 2-year old daughter to Julia Gabriel Speech and Drama without thinking twice. When I joined the YEO (Young Entrepreneur's Organisation) a few years back (YEO is an exclusive club open to those who are under 40 and make over $1m a year in their own business), I discovered that those who were self-made thought like me. Many of them with net worth well over $5 m, travelled economy class and some even drove Toyotas and Nissans, not Audis, Mercs, BMWs. when I see, my children laughing and playing and learning so fast. I think the point I want to put across is that *happiness must come from doing your life's work (be it teaching, building homes, designing, trading, winning tournaments etc.) *and the money that comes is only a by-product". P.S :- Why I posted this picture of a Yachts ? 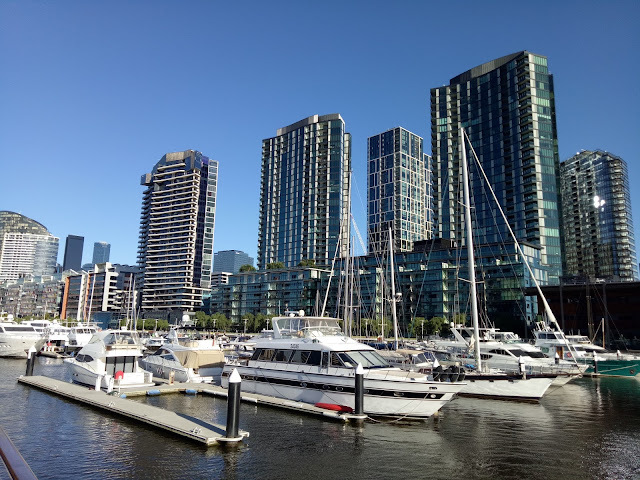 Because, over the weekend I went on a Boat Cruise along the river Yarra (Docklands Melbourne) with some of my friends. And, one of my friend looked at these Yachts in the water and told me that his Boss, recently bought a similar one recently. And, he told me " He is actually so busy, always on the move travelling, not sure if he ever gets some time to actually drive his Yacht". 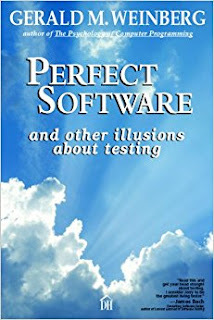 This article is a book review on “Perfect Software and other illusions about Testing” by Gerald M. Weinberg. who is an American computer scientist, author and teacher of the psychology and anthropology of computer software development. He is one of the highly reputed and widely known personality in the field of Software Testing. As the one who was there from the beginning of industry and had seen and done everything. He had written more than 40 books ranging from IT, Psychology, Software testing etc. One of the most recognizable expressions around, An Apple a day keeps the Doctor away reinforces the importance of having a healthy diet, rather than simply taking the supplements like Vitamins and Protein powders. Similarly, soft skills like right attitude, mindset, clarity of thought and expression, communication are a vital part of a software testers job but, unfortunately not many of the books on testing these days actually focus on these. Most of the Software testing books in the market talk about the types, methods, and theory of software testing, without actually focusing on the important soft skills required for the job. To add to the confusion, there is talk of Automation and promotion of various tools that promise to Automate the whole of testing and perform miracles. This Book focus on the most vital and important part of Technology, the Human aspect. The books start off with the most crucial question of, why do we need to test. Facing the reality of what Testing cannot do and the myth of testing everything. Then, what is actually testing is, the human nature of blaming, fault finding, defensive reactions. The author undoubtedly is one of the most knowledgeable and with his wide experience, explains some of the pitfalls and how to avoid them. How the book is organised? I really liked the way the contents of the book are organised. Firstly, the name of the Chapter informs the reader, the essence of what is coming. Then, there are sub-sections to make things more clear and explicit, followed by a succinct Summary. What is more interesting is the Common Mistakes section which highlights some of the glaring, obvious, not so obvious mistakes people tend to commit, due to various reasons like going with the flow, stereotyping, out of ignorance, lack of proper understanding or may be due to various constraints like Budget, resources, time etc. I loved this section, and the explanations are really handy. As a common quote says ‘A wise man learns from the mistakes of others’. The subsequent chapters talk about, how to make a good Test, common fallacies (mistaken beliefs, especially one based on unsound arguments) and what testing is not. So many times, we hear people say things like ‘So you are the testers who brake the system’. For them, I would say ‘we are the ones who investigate the software and find where the system is broken’. So, there is a whole chapter about some major fallacies about testing and you can see for yourself, which one you are fall into. Testing is more than banging Keys – another chapter provides answers to all those people who think that anyone can test anything and every action performed is testing. It may be but, there is a subtle difference that needs to be noted. Is there a problem? Isn’t Testing the individual parts is as good as testing the whole? Again, a big No. Once I saw this written on someone’s Tee Shirt- ‘Been there, done that but, can’t remember anything’. I admit, at times it feels like that. And, that’s where this book comes handy for even a veteran IT or testing professionals. The most fascinating aspect of this book are the real-life examples that Gerald writes about. Being a Senior Tester by now, I have gone through these stages of people confounding me with all their own interpretations and understanding of what testing means and some common questions like, why do we need to test? Do we need to do the whole thing again? The fix would not affect anything and no testing required, why do we need to do a System testing when a UAT is being done etc. And, sometimes the whole world seems to be fighting against you (Developers, PM's, BA's and End Users). Over a period of time in the industry, I have learnt the hard way but, I feel that it would have been so much easy, if I had read this book a decade before. This books needs to be read not only by testers but, everyone else involved in the SDLC - Software Development Life Cycle. Because until, one knows and learns about testing, they can’t appreciate the importance and value of testing. Words mean many things and sometimes they mean opposite of what they sound. Importance of right communication, and the use of Satir Interaction Model to unravel, unfold, unwind communications. Further on, this book talks about the common misnomers about Test Automation, the Silver bullet that apparently has solutions and answers for everything. The most interesting part comes in the last. Who is not interested in knowing about scams. everyone hates scams but, loves to uncover and expose them. Gerald, brilliantly finishes the books with some of the famous scams of Testing and hits the nail in the last but one chapter called ‘Testing Scams’ where he talks about the scams in Testing world, that most common people are unaware of. Coming from a background of testing, this book is an absolute pleasure for me to read and review. The author Gerald with his straight forward, honest write up about the Software testing is a brilliant master piece, everyone should read. Not limited to only the Testers, this is a must read for everyone who is in the IT field like Project Managers, Developers, Business Analysts, SME's just about everyone involved in the SDLC, Software Development Life Cycle irrespective of Agile, Devops or the traditional Waterfall models. The book reinforces the knowledge of Software testing to someone who is already working and an eye opener to anyone who wants to know about Software testing. Discount: All Courses on site are USD$10.99. Courses are typically valued at $200 or more, and range in thousands of topics. 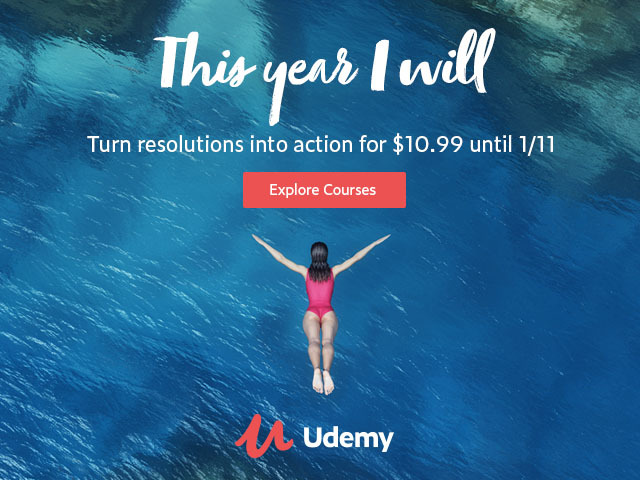 Udemy challenges new and existing students to turn their New Year’s resolutions into action by learning the skills needed to achieve their goals. The catalog includes over 55,000 courses in everything from development and design to yoga and photography. Whether starting at step one or brushing up on skills with a comprehensive course, Udemy has something for everyone. With courses that never expire, you can learn anytime, anywhere, on most devices. Better yet, each course comes with a 30-day money-back guarantee, so you can start learning risk-free. Kick off a year of learning and growth on Udemy.com. Accomplish your goals with valuable, in-demand skills. What will you learn in 2018? Who is really happy in this world? I just want to be happy. A lunch time talk and this is what one of my colleagues said. There is nothing wrong in that wish or thought to be happy. In fact, it is said that “ Ananda Mayo Bhyasat” – the original, constitutional nature of a spirit soul is to be happy and blissful. That is why, the living being is always seeking happiness in what ever they do. Every one seeks happiness, even a drug addict is trying to get away from miseries and find something that he feels will give him happiness. The problem is that they are trying to find the happiness in a wrong way and wrong place. For example, there is a Mango tree full of mango's on the bank of a pond.Someone sees the reflection of the tree and mango's in the the water. Immediately, jumps into the water and while swimming in the water,tries to catch hold of the mango fruits that were reflected in the water, he would get no where. Its just a reflection, a shadow while the real fruits are hanging on to the tree at the bank. Coming back to the topic of – "I want to be Happy", Srimad Bhagavatam 11.9.4, explains that in this world, really there is only two types of people who can be free from, stress, Anxiety and merged in great happiness.The first one is the topmost Enlightened person who had taken complete shelter of God.The second one who is at the bottom is the most ignorant or childish fool who doesn't bother about anything worthwhile at all. He is completely immersed in his world of indulgence like, Alcohol, Drugs etc. As they say – Ignorance is bliss.However we should not place these two types of people on the same level because, they are poles apart and the final destination of these two is different. So, what about the one in the middle who is neither a transcendental spiritualist nor the bottom rung person. The one in the middle like me and you are the most miserable – I stopped my out-pour of words and looked at my friends who are looking at me in various expressions like, shall I say - shocked, dismayed or whatever. Just then, One of my colleague made an interesting Analogy.He said – Yeah, this makes sense because, during the exams time in college, only two types of people are happy. One, those who studied everything and confident about answering the exam paper. The other is the one who did not study anything. Although the one who did not study anything is not confident but, at least indifferent and rather happy because, he knows that anyway he did not study or put much effort and in the exam he will take a shot, attempt, write or answer something. And, if he passes the exam, that’s a bonus and if doesn't pass, then no worries because, he don't care anyway. But, the ones in the middle like you and me are the most miserable because, we are in between the two, trying to study till the last minute, cram everything into the brain and somehow get a respectable score, if not a High Distinction or Credit. 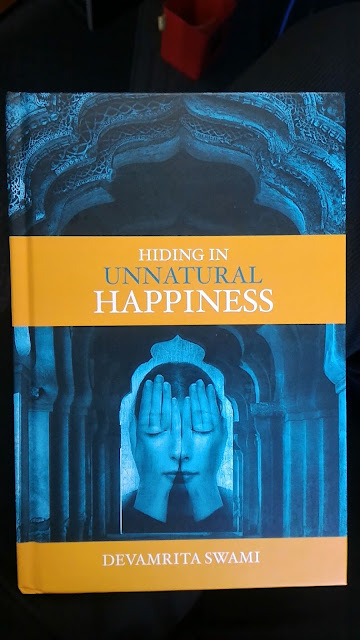 So what about the people like me who are in the middle, neither enlightened Spiritualist nor a Childish ignorant.I was thinking of an answer for this and came across this wonderful book written by Devamrita Swami, titled " Hiding in Unnatural Happiness". To talk about this book, I would like to refer to a quote, where it is mentioned that “mitam ca saram ca vaco hi vagmita iti" which means "Essential truth spoken concisely is true eloquence." This concise book, eloquently written by Devamrita Swami, touches on the most crucial aspects of real Happiness for genuine spiritual seekers. I hope, you enjoy reading it. ** Note: This article had been updated with a new link for purchasing the book written by Devamrita Swami from Amazon (Both Kindle Version and Hard Copy ). Also, I made few changes to the text and content and thus, republishing the article.